This week it's a 1 photo sketch to stimulate us all into creating something wonderful! 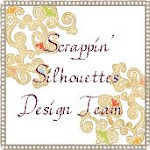 Please go visit Scrappin Silhouettes and see all the amazing DT work this week and join in the challenge! As soon as I saw the sketch I knew I wanted to scrap one of my winter photos from the fabulous snow earlier in the year. It absolutely ruled our lives at the time! I walked to work, on a couple of days when I couldn't get the car out and took photographs on the way. It was so quiet and beautiful I could have wondered around for hours in the deep crisp virgin snow. I made this almost monotone layout and the only journalling I will add will be the date and place, I wanted to keep it really simple (as usual!) Also as you can see I have used my new Martha Stewart punches from QVC I fell in love with them during the show and broke my stash diet (yes I had been on one for over 3 weeks but they were a really good price!!). I have used the Apen snowflakes around the page punches and the fabulous snowflake 'strip' punch that punches both sides to leave the cute row of snowflakes. I broke with the traditional snowy white and went for a silvery blue palette as it worked much better with the photo. What do you think??? Wow! Breathtaking and stunning! I love the mono look! Such a pretty and peaceful pic! Great take on the sketch! Gorgeous! Your photo is amazing, layout is so elegant and graceful. oh neat! This page is wonderful monochromatic! Amazing photo of the snow!